Heat the butter and saute the onion and celery until very soft. Add the ham, chicken meat, and sausage; cook 5 minutes, stirring occasionally. Mix with the bread cubes and cool. Beat the eggs with the spices, salt, and stock. Combine with the bread and meat; mix well. Add more stock if necessary. Bake, uncovered, until top is brown and dressing reaches 165F internal temperature, approx 30 minutes. Chef: complimentary flavors, good contrast of moist and some crunch (don't want it to be too moist. Team/personal: I didn't think the chicken was necessary.It didn't seem to add any extra flavor and the texture did not go as well as the other meats. 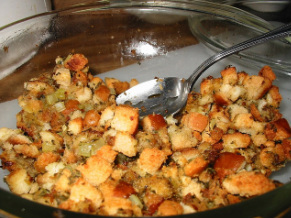 Lessons Learned: the key to a good bread stuffing is not to be overmoist or overdry. You need to be flexible with the chicken broth and adjust as needed. Stuffing in a bird takes more time and has potential health risks. It is better to just pay attention to the stuffing and make it separately basting while it cooks if needed.